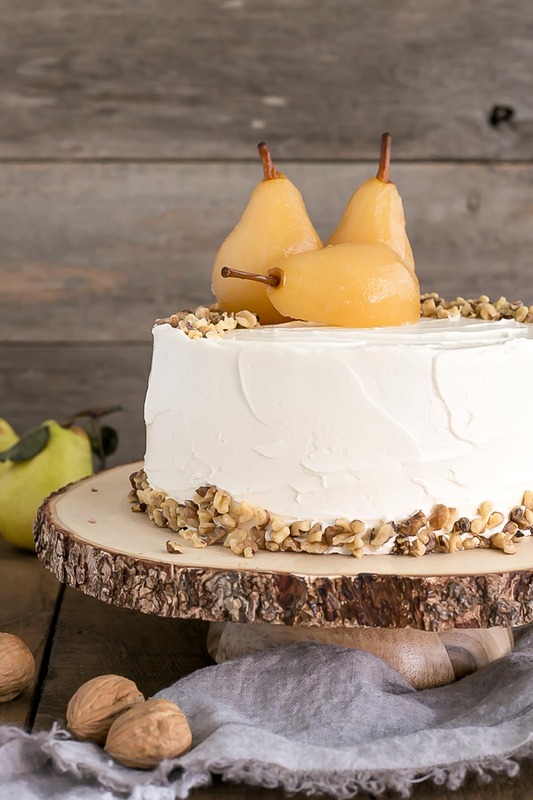 This Pear & Walnut Cake with Honey Buttercream is the perfect way to kick off the Fall season. It’s September! Are you as excited as I am?? The weather has finally, finally cooled off a bit, and I am itching to get back into jeans and sweaters. I’m going to try to refrain from inundating you with pumpkin recipes this year. There are so many other seasonal flavours to bake with that I think I can stay away from pumpkin this year. Or at least, I’m going to try! I’m kicking off my favourite season with a fruit I rarely eat, never mind bake with. Truthfully, I don’t eat a lot of any fruit, but I can probably count on one hand how many times I’ve bought pears in the past 5 years. I can’t explain why exactly, just that I tend to gravitate towards apples when it comes to my limited fruit consumption. 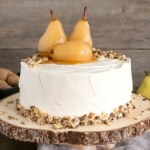 I already have an Apple Pie Cake, so it was time to try something new with this Pear & Walnut Cake. 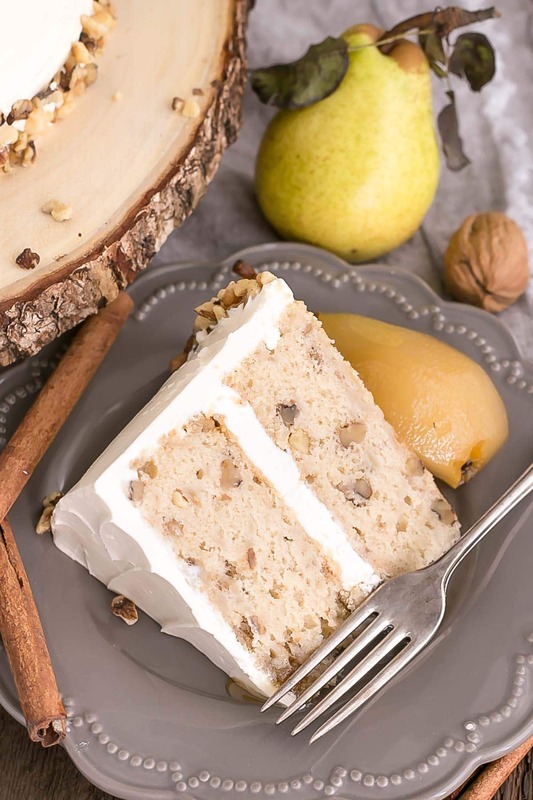 There are fresh grated pears in the cake which add a ton of moisture, and some toasted walnuts for additional flavour and some crunch. I paired it with a honey buttercream for something a bit unique, but you could leave the honey out if you like and have a simple (but delicious) vanilla buttercream. 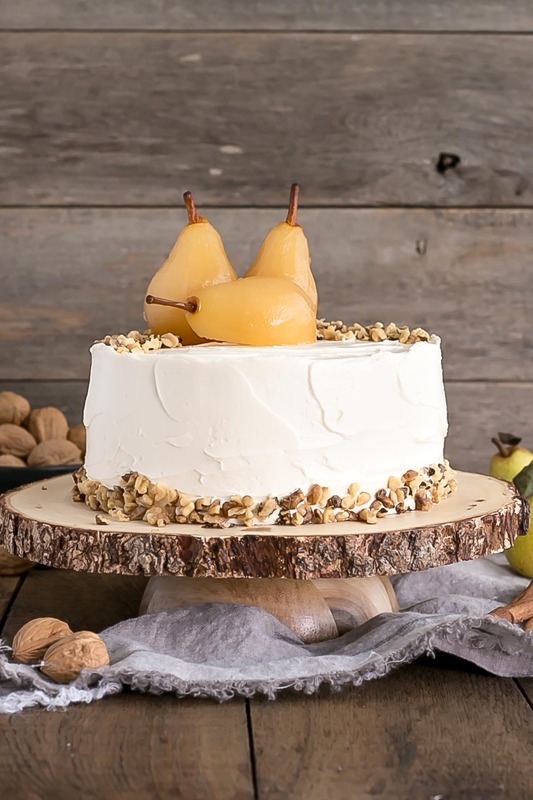 The poached pears are totally optional for this, as I just used them as decoration, though they’re easy enough to make if you’re feeling up for it. I had to do mine twice, because the first pears I used were too soft and/or I cooked them for too long, so they were a bit mushy when I took them out of the liquid. The second batch went much better. If you decide to do the poached pears for the top, do them the day before so they can rest in the liquid in the fridge. I’d also bake the cake layers the day before, because I like to spread out my cake-making time! This Pear & Walnut Cake is incredibly moist, but it is a bit more on the dense side. If you’re looking for a light and fluffy cake, this is not it! But I love it. 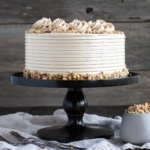 To me, the texture of this cake is perfect for Fall: comforting and delicious. The spices and walnuts add amazing flavour, too. I didn’t realize how much I love walnuts in cake until I made my Walnut Cake last year — it’s one of my favourites. If you’re going to do the poached pears as garnish, do them a day in advance. I used both Anjou and Bartlett pears for this recipe, but any kind of pear is fine. Be sure to toast your walnuts in advance — it gives them more flavour. About 5-10mins at 350F, until they are fragrant. **NOTE** Do a day in advance. Place honey, water, lemon juice, and cinnamon into a medium pot (big enough to hold the pears so they will be covered). Bring to a boil over med-high. Add pears and simmer over medium until tender, turning occasionally (approx 20-30 mins depending on how firm your pears are - insert a sharp knife to test). Do not overcook! Gently remove pears with a slotted spoon and place them into a medium bowl, cover with the honey syrup (so pears will be covered). Cool completely then place in the fridge to chill overnight. In a medium bowl, whisk flour, baking powder, cinnamon, and salt until well combined. Set aside. Gently fold in walnuts and shredded pears. Spread evenly between the two pans. Bake for 50-55mins or until a toothpick inserted into the center comes out mostly clean. Add honey and whip until smooth. 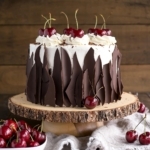 Frost the top and sides of the cake in a rustic manner. If desired, add toasted walnuts along the bottom and top, and place poached pears on top. Secure pears in place with toothpicks and drizzle with poaching syrup. * Note that the honey syrup will be very strong in flavour and may over power the cake if you choose to use it. 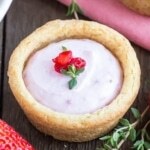 However, you can always save it and use it as a topping for ice cream or yogurt. Poached pears recipe adapted from Epicurious. 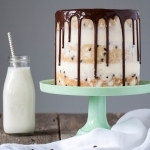 Do you think I could make this icing with Honey candy flavoring from Lor Ann? Hi Mitzi! I’ve never used that but I don’t see why not! Gorgeous cake ( yours that is, can’t get that rustic look with the buttercream) I made it last night and excited to taste it at my friend’s farewell dinner tonight. Hi! I think the photos make the buttercream seem whiter than it is. It can be quite yellow depending on the color of the butter. I use Natrel from Costco. To help get buttercream white, you can add a tiny tiny bit of violet color gel to help neutralize the yellow tone. This is a great recipe. If I would like to make this eggless is it possible. If so, what can I use to replace the eggs. Hi Muthu! You can look up some egg substitutes for the cake part, but you can’t make this frosting without eggs. Hi Cindy! Nope, either works for both 🙂 Let me know how it turns out! Hi Mahnia! The layers don’t rise a ton, but they do rise. Have you checked to see if your baking powder is expired? 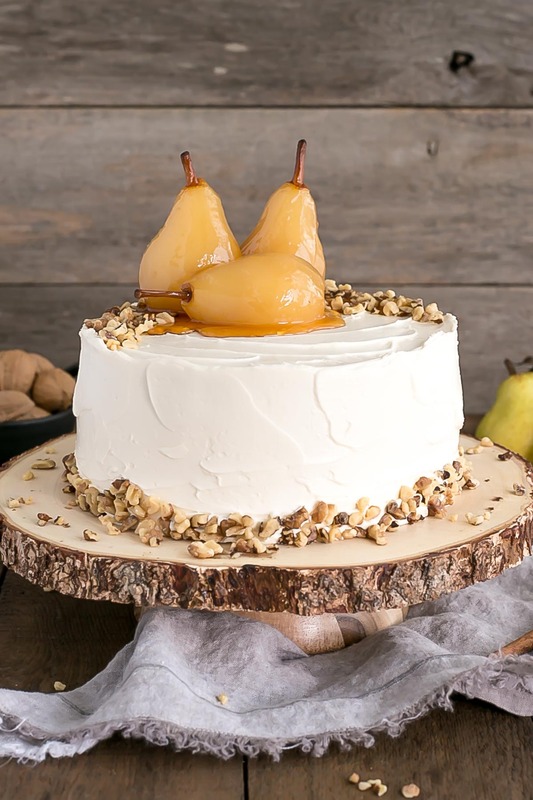 If I was to make this cake to take for dinner elsewhere.. should I wait to put pears on top when I get there.. will the pears be too wet to stay on top for very long? This looks lovely and I found the exact cake plate to present it on.. I’m excited to make this cake, even though I’m not much of a baker. 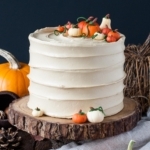 This is such a beautiful fall cake! I love it. And those pears – yum! Absolutely stunning! Perfect for Thanksgiving! Liv, you have out-done yourself with this cake. It is STUNNINGLY beautiful … and I bet tastes even better than it looks! 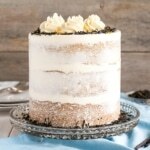 Dense cakes are the best 😀 Can’t wait to make this! 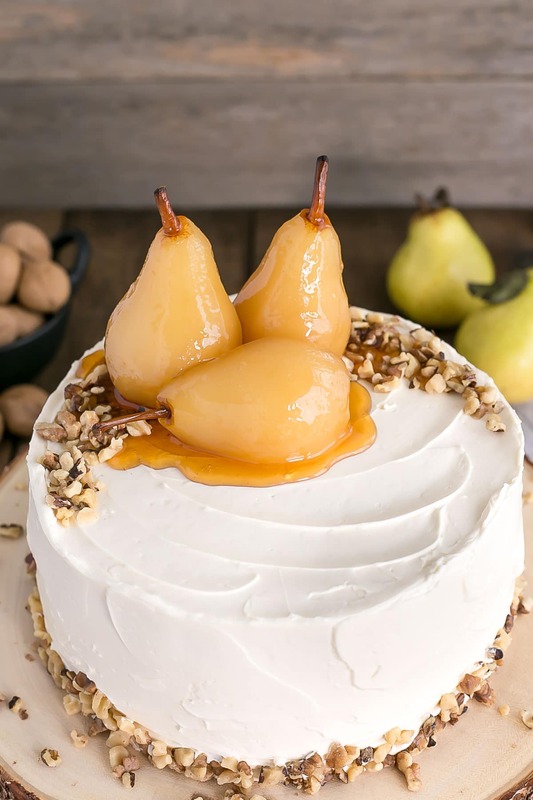 Those poached pears are calling my name! 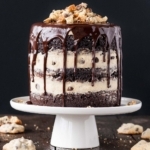 I, too, love dense cakes and this is so perfect for fall. It was a hot summer in LA so I’m opening my arms to the slightly cooler season. This is a stunning cake, I just love everything about it!! Me encantan sus recetas, me apasionan. El vídeo sería espectacular si pudieras mostrar cómo trabajas la cubierta rústica para ver el manejo de la espátula.